I had made plans to visit my daughter at UCSB today, but due to a retreat, she wasn't going to be available until noon, giving me the morning for some gratuitous peakbagging. I had spent the night camped in the town of Mojave on the western edge of the desert. With train and road noises, it wasn't the best sleep, but I managed. All of the peaks here were short but steep hikes in and around the Rosamond Hills. I had been to the area on a previous visit, but only had time for about half of the offerings - today I would visit the remaining ones. The rains have left the Western Mojave a wonderful green, unlike anything I've seen in recent years here. It should be a fine season for wildflowers. The area is a patchwork of BLM and private lands. The rural homesteads are often sad collections of junk strewn about yards with badly neglected homes. Mining is an old and ongoing tradition here, with gold mining slowly consuming Soledad Mtn and other quarries taking their toll on nearby hills. 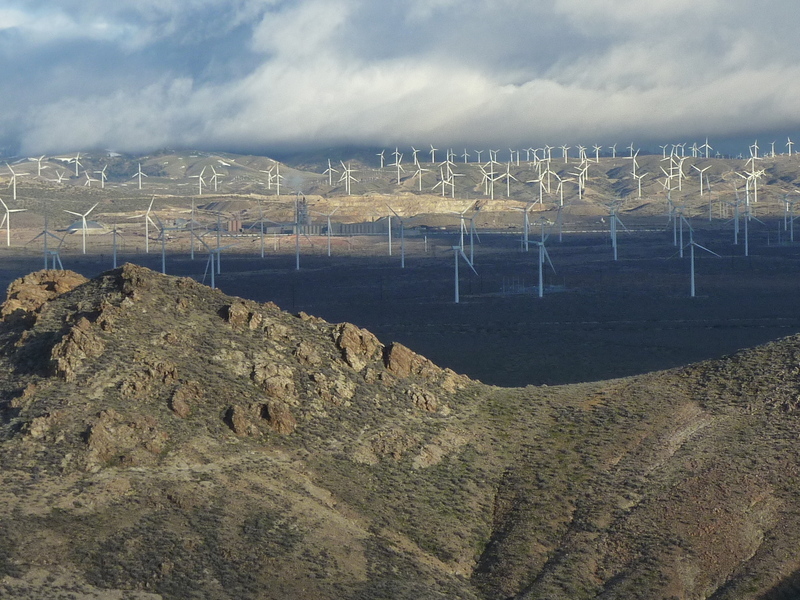 Around all of this, wind and solar farms have sprung up over the past decade, slowly transforming the desert landscape yet again. My first stop of the morning was to get coffee in Mojave, and the second one was to Standard Hill, just west of SR14 and north of Soledad Mtn. This small hill is the site of an old open pit mine. There is no active mining going on, but the hill is surrounded by fencing. So close to the road and open to view, I didn't want to park and go over the fence. A better approach might be made from the south or west sides, but for now I left this for another time. Located southwest of Soledad Mtn, paved Mojave-Tropico Rd runs along its west side. Dirt roads can get you a bit closer. There is a great deal of trash dumped in this area, sadly. Once past the trash, a climb up the NW side of the mountain is steep but enjoyable. The ground was alive with more green that one is used to in the desert. There is some class 3 scrambling opportunities among the cliffs near the top, but there are class 2 chutes cutting through them for easier options. From the summit, Soledad Mtn dominates the view to the north. Edwards Air Force Base stretches out to the east, windfarms to the northwest. South and east are desert flats with scattered developments. Far to the west the Tehachapi Mtns had a fresh dusting of snow down to very low levels, though much of the view was obscured by low clouds. Almost 4mi due west is this slightly higher summit. There are mining roads cut all over the mountain but very little of it seems to have been carried away, at least compared to Standard Hill and Soledad Mtn. The big going concern is a gravel pit on the east side in the desert floor. I used a dirt road across the flats connecting the two, but there is a paved road heading west a mile to the south. I parked behind the quarry at the base of the peak and hiked up from there. There is a better view of the Tehachapis from the summit, but otherwise similar views as Peak 3,377ft. On my way back I was startled by a large domestic sheep staring at me, completely unbothered by my presence. Where it came from I had no idea - he had no friends anywhere about, near as I could tell. The highpoint is found near the western end of this range that stretches 16mi east onto Edwards AFB. The shortest approach is from the north where there is a steep 4WD track running up to the NE Ridge. I drove the easy part of this, parking before things got more serious - I chicken out pretty easily when it comes to hill climbs. I think I've watched too many YouTube videos where things go badly wrong. I hiked up the steepest portion of the track, then followed the short ridgeline to the highpoint. I took a more direct route down the north side on the return, some short bits of class 3 and even a few tunneling options. A few miles SSW of the Rosamond Hills HP, this was the easiest of the day's summits, taking less than 10min to reach the top from the north side. It, too, has a rocky summit with short class 3 scrambling.